When an airbag works properly, it can prevent injuries and save lives. However, when there is an airbag defect, even a minor fender-bender can cause serious injuries. The attorneys at Cellino & Barnes have represented many individuals who have been injured by defective products. If you or a loved one has been injured and believe a defective air bag may have caused your injuries, call us now at (800) 888-8888 or contact us by clicking on a Defective Airbag Attorney. For information on Recent Airbag Recalls, please feel free to review the information below. (Reuters) Honda Motor Co will soon recall 135,000 vehicles in Japan as recalls in the United States involving potentially defective airbags by Takata Corp expand, a Honda spokeswoman said on Friday. The spokeswoman said she did not know when the recall would be announced. Defective Takata airbag inflators, which can explode and shoot shrapnel into the car, have been linked to five deaths. More than 16 million cars have been recalled globally since 2008, the bulk by Takata’s top customer Honda. Several carmakers in the U.S. have issued regional recalls of certain models to investigate what is causing some Takata airbags to explode with excessive force. U.S. safety regulators have ordered Takata to have those recalls expanded nationwide. As a result, Honda will recall similar models in Japan, the spokeswoman, who asked not to be named, told Reuters. An official at Japan’s transport ministry has said that a nationwide U.S. recall could add 200,000 Honda and Mazda Motor Corp cars to the 2.6 million cars fitted with Takata airbags already under recall in Japan. Mazda spokeswoman Keiko Yano said on Friday: “We are still considering whether to conduct a domestic recall, but no conclusion has been reached.” Toyota Motor Corp said on Thursday it would call back 190,000 more vehicles to replace potentially defective airbags made by Takata, and Japan’s regulator said it may change its recall system to better respond to what it called an “unprecedented” crisis. There have been 17 incidents in which the side and curtain airbags deployed as a result of a door being slammed too hard while the vehicle was running and up to 90 seconds after it was turned off. Faulty sensors appear to be the cause of this defect. Scion dealers are replacing these sensors at no charge. Toyota is also recalling 156,555 Tundra’s (2003-2005 model years) as they do not comply with the child seat anchor safety regulation. The recall requires the disabling of the front-seat passenger airbag cut-off switch. Although disabling the switch will comply with an NHTSA order, some safety experts question the decision and believe there may be an increased risk of injury to children. Disabling the switch means the airbag will always deploy and the right front passenger seat will always be unsafe for a child. The NHTSA has an ongoing investigation into more than 800,000 DaimlerChrysler vehicles for potentially defective airbag sensors. These sensors can delay or prevent the deployment of airbags in the event of an accident. The vehicles affected by the investigation include 805,000 (2005 and 2006 model-years) Dodge Caravan, Dodge Grand Caravan and Chrysler Town and Country minivans. DaimlerChrysler has also announced its recall of 145,000 light-duty Dodge Ram 1500 pickup trucks (2006 model year). The trucks’ airbags and seatbelts are not compatible with some child seats. An NHTSA investigation found that when a car seat is in the front passenger seat of a Hyundai Elantra, the computer system may confuse it for an adult passenger. Based on this investigation, Hyundai is recalling 240,000 Elantra sedans (2004-2005 model years). Hyundai reports this computer error can occur if an adult was in the passenger seat when the ignition was turned off and then a car seat was later installed. When the vehicle is then restarted, the computer may misinterpret the car seat for an adult passenger. Approximately 12,036 SAAB 900’s (1998 model year) have been recalled. Static electricity can build up within the passenger-side airbag module and create enough of a charge to cause the airbag to deploy. Most cases have happened when dusting or wiping the dashboard, starting the car, or closing the door. Dealers will install a front passenger-side airbag module ground strap to fix the problem. 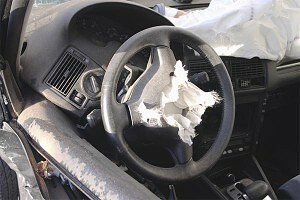 If you or a loved one has been injured by a defective airbag, call Cellino & Barnes now at (800) 888-8888 or contact us.